SEATTLE - Menu prices are up 21 percent and you don't have to tip at Ivar's Salmon House on Seattle's Lake Union after the restaurant decided to institute the city's $15-an-hour minimum wage two years ahead of schedule. Seattle's law, adopted last year after a strong push from labor and grassroots activists, bumped the city's minimum wage to $11 beginning April 1, above Washington state's highest-in-the-nation $9.47. Scheduled increases that depend on business size and benefits will bring the minimum to $15 within four years for large businesses and seven years for smaller ones. There's little data yet on how the law's working. "To the extent that we can look at macro patterns, we're not seeing a problem," said Seattle Mayor Ed Murray. As Washington, D.C., and other cities consider following Seattle, San Francisco and Los Angeles in phasing in a $15-an-hour minimum wage, Ivar's approach, adopted in April, offers lessons in how some businesses might adapt. 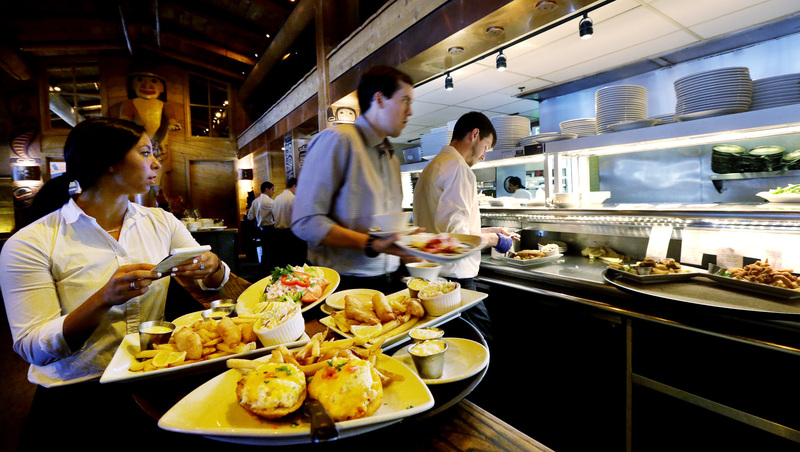 Ivar's Seafood Restaurants President Bob Donegan decided to raise prices, tell customers that they don't need to tip, and parcel the added revenue among the hourly staff. For some of the restaurant's lesser paid workers - including bussers and dishwashers - that's meant as much as 60 percent more. Revenue has soared, supportive customers are leaving additional tips even though they don't need to, and servers and bartenders are on pace to increase their annual pay by thousands, with wages for a few of the best compensated approaching $80,000 a year. Rochelle Hann, 25, is a second-generation worker at Ivar's. Like her mom, she has performed a variety of roles, including serving, bookkeeping and even dressing up as a giant clam. If she keeps working 30 hours a week, her annual pay will jump about $12,000 - money she's socking away for accounting classes at a community college. Brett Richards, a 50-year-old singer and guitarist, has worked 25 years in food service, including the past eight at Ivar's. Before, he made minimum wage, plus tips. Now, he gets $15 an hour, plus a share of the 21 percent menu price increase, plus any additional tips customers leave. He expects to make almost $7,000 more this year, money that's helping him with his increased rent and with taking his kids out to eat a little more often. "The economic justice that would be happening for our employees would be borne by our clients, who are extremely vulnerable people," said executive director Daniel Malone. In the restaurant industry, where many low-wage workers are employed, adapting could mean pooling tips among all workers, cutting shifts or relying on technology - such as mobile phone applications that let customers pay electronically, rather than having someone dedicated to running the cash register. "This last jump wasn't that far out of market so it didn't require a lot of reworking of the financials," says Anthony Anton, president of the Washington Restaurant Association. "Those second and third jumps will be much bigger jumps. Everyone is talking about what to do." At Ivar's Salmon House, decorated with century-old, hand-carved canoes and tribal art, Donegan attributes at least some of his pay policy's success to Seattle's white-hot economy. Looking out the broad windows of the dining room across Lake Union, diners can take in pleasure boats and kayaks cruising by, seaplanes landing, the Space Needle - and across the water, the ever-growing Amazon campus that has brought tens of thousands of workers to the city in the past few years. A few other table-service restaurants have started following suit, and Donegan said he gets inquiries every day from owners wondering how Ivar's policy is working. But the approach is unlikely to be replicated among fast food restaurants or others where servers make less in tips - even though New York City is making $15 an hour the minimum wage for fast food chains.